There are thousands, probably millions of beauty products on shelves and counters across the world. I am making it my personal mission to try as many as possible, but that’s a side project. The millions of products out there come in all, shapes, sizes and of course – textures. So that’s what I was thinking about – different textures of products and how they can change someones opinion of a product and how different brands take a different approach to the texture issue. The texture question first came up for me when I went along to the oh-so-chic Estee Lauder offices in central London to visit the Creme De La Mer PR team. Creme de la Mer is an extremely high-end product containing a rare algae only found off the coast of California that is meant to have rejuvenating/anti-aging effects. I was invited to go an ‘discover’ Creme de la Mer and jumped at the chance – since I haven’t won the lottery or been promoted to Queen of the World – to find out more about a brand that is honestly, far out of my price range, the 30ml gel-cream moisturiser costs £92. Anyway, cost aside, what I found really interesting about the Creme de la Mer brand is the approach it takes to product textures. Rather than the traditional skin-type approach that the majority of brands focus on, CdlM bases the product choices on the texture preferences of the customer – the logic being that choices will be made almost subconsciously to address the skin care concerns. Sort of like if you feel hungry for chocolate it’s your body telling you your blood sugar is low. My personal preference is a gel – I can’t get enough of gel products. Pretty much, if you call it a gel then I will want to try it (lip gel, moisturising gel, fake-tan gel, hair gel….whatever) so when I heard there was a Creme de la Mer gel-cream I knew this was the one that I would prefer. Other brands do take a different approach, but the texture issue came up again last week when I was talking to one of the head-honchos behind Clinique. I was asking him about the texture choices/options a brand offers and what influences them. I was most interested to hear that there are different clear preferences in different locations across the world – in America, gel textures are the big sellers and in Europe creams are King. According to this, I have an ‘American’ preference when it comes to skin care. I definitely do much prefer gels – one of my favorite moisturisers I have been using (and almost got to the bottom of the second pot of) is the Clinique Moisture Surge gel-cream – I absolutely adore it and will no doubt buy a third pot when I finish the dregs of this one! So what do you think about different textures – do they influence product choices? Do you have a preference or do you prefer the products on an individual basis rather than based on the texture? In the picture above I have included the two products I have mentioned (Creme de la Mer and Clininique Moisture Surge) plus the Biotherm Aquasource Skin Perfection Cream – described as a ‘sorbet’ and I love this because of the texture so thought I would throw it in there as another example of a product I love based on the texture. 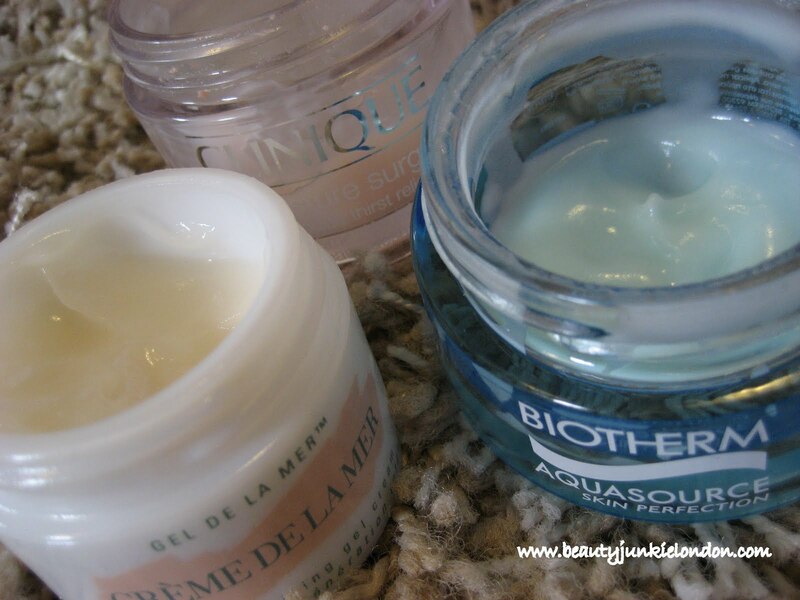 Creme de la Mer and Biotherm products were sent free for review. The Clinique I bought myself (although first time I tried it it was sent for free- then I fell in love and bought it again) yes, I’m probably being honest to the point of it being annoying – but hey, honesty is important. Amazingly accurate and informative! I am impressed! I love the three of them. This post is very informative. For me texture is probably the most important aspect of a product, that and scent really are the first impressions of a product that create a lasting impact, more so then the effects of the product. if you like gels i found a fab fake tan gel, nice colour, not bad smell, and amazing price. if you want details email me.